Mens soccer star Robb Rolfing ’00, who helped the Brewers to their first NCAA national championship bid last fall, was named to the National Soccer Coaches Athletic Association/Adidas Division III All-America Team for the Northeast Region. And tennis players Sarah Tighe ’03 and Becky Weldon ’03 were named to the New York State Womens All-State Team. 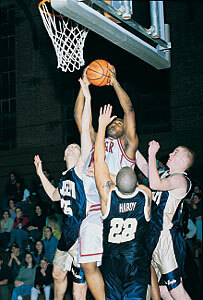 Vassar’s athletes have also been noted for their academic distinctions. Basketball team members Brett Lampiasi ’02 and Josh Beauregard ’00 were named to the the Upstate Collegiate Athletic Association Academic All-Conference team this year. So were Bea Milligan ’02, Lauren Nishimura ’02, and Lisa Ercalono ’02 from the womens squad. Among Vassar swimmers, Amanda Croushore ’02 and Kendra Smith ’00 were named to the UCAA Academic All-Conference team. Before breaking an ankle in a game against Wesleyan, junior Tirek Gayle, seen here soaring above the opposition, was a top scorer and leading rebounder for the Brewers. Nine field hockey team members were named to the 1999 National Field Hockey Coaches Association Division III National Academic Squad. They were Kathy Acosta ’01, Annalisa Clink ’01, Amy Cook ’01, Jen Cunningham ’00, Brooke Gentile ’01, Julie Katz ’02, Sarah Milo ’01, Sarah Montross ’02, and Andrea Reyes ’01. Former Vassar field hockey coach and teacher Elizabeth (Betty) Richey was named to the All-Century Womens Lacrosse Team in the November/December 1999 issue of Lacrosse Magazine. Richey was a member of the U.S. women’s lacrosse team for 25 seasons between 1934 and 1960; a member of the U.S. Field Hockey Association Reserve and All-American teams for 20 years; was inducted into the U.S. Field Hockey Hall of Fame; and was once cited as the greatest lacrosse player in the nation. Richey began her 41-year teaching and coaching career at Vassar in 1937. She helped found the Intercollegiate Women’s Squash Championship in 1965 and created varsity programs at Vassar in field hockey and mens and womens tennis and squash when the college entered intercollegiate competition. Each year, the college honors Richey’s legacy by hosting a field hockey tournament and honoring an outstanding field hockey, squash, or lacrosse scholar-athlete, both in her name. The team earned the title of state champions at the New York State Womens Collegiate Athletic Association championships. Vassar women earned a state championship title in the pool. Above: Vivian Chin '03 in a freestyle race. Benjamin Chung ’03 set four new school records in the 200 and 500 freestyle, the 400 Individual Medley and the 200 Butterfly at the New York State Championships. The men set a record this year for the most wins in a single season. But they lost their bid for the Eastern Collegiate Athletic Conference championship to Richard Stockton College of New Jersey in the second round. The score was 77-48. The womens squad fought its way to an ECAC championship but lost to New York University 79-46. The women were the Division “D” champions at the Howe Cup tournament hosted this year by Yale University. Team member Greta Lundeberg ’01 received the Scholar-Athlete tournament award. The team had the division III championship at the National Intercollegiate Squash Racquets Association Championships within sight, but lost the bid 5-4 to Amherst College.